Daily ASA intake appears to effectively protect against some cancers, according to available studies. Scientists have now investigated the mechanism which might be concealed behind the cancer blocking properties of ASA. Acetylsalicylic acid (ASA) seems to be a real all-rounder. After a stroke or heart attack, the active ingredient prevents the clumping of platelets, and the anticoagulant also helps against fever, pain and inflammation. In recent years, evidence has accumulated that the daily intake of ASA can even protect against cancer. In early 2012 a meta-study published in The Lancet aroused euphoria in the medical world: in it scientists analysed 51 studies, which had actually investigated a connection between the daily intake of ASA and the risk of vascular diseases. They found that ASA also apparently reduces the risk of dying from cancer. The observed effect was rather staggering: during the observation period of five years, the daily intake of ASA was able to reduce the risk of dying from cancer by up to 37 percent. That ASA for some reason works well against cancer is not a particularly new finding. Conjecture on this has been around for more than 20 years. The long-term study of this was likewise published in January 2011 in The Lancet. It showed a reduced risk of 21 percent of cancer death for subjects who had for at least four years taken a daily low dose of ASA (75 milligrams). The control group received a placebo. The lower mortality rate remained constant even 20 years after treatment with ASA, the doctors reported. The effect even improved with increasing age of patients and duration of ASA intake. In mid-2012 another meta-study appeared which dealt with the potential of ASA in cancer prevention. Here scientists evaluated the data of more than 100,000 men and women from the US who had participated in Cancer Prevention Study II. Here however daily ASA intake was only able to reduce the risk of dying from cancer by 16 percent. “One can now safely say that aspirin reduces the mortality and the extent of cancer”, comments Bernhard Woermann, Medical director of the German Society of Haematology and Oncology (DGHO) while speaking to Der Spiegel. “Compared to the first study [risk lowered by 37%] it brings us back to reality. The truth probably lies somewhere in between”. How does ASA affects the mutation rate? Although the results of the study are numerically not completely consistent, the positive effect of ASA with respect to cancer mortality becomes significant. On what process this relies has as yet not been clear. Now scientists have explored which mechanism could be concealed behind the cancer obstructing properties of ASA. In one study, a team of geneticists and gastroenterologists examined biopsies of 13 patients in which the precancerous condition Barrett’s oesophagus had been detected. 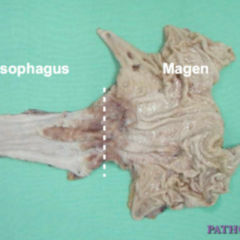 This can be described as a metaplastic conversion of the epithelium of the oesophagus. The scientists studied the clinical course of progress of patients and the rate of mutation in Barrett’s oesophagus for a period between 6 and 13 years on the basis of 161 patients’ biopsies. The aim of the study was to detect the mutation rate in tissue samples at different time points after administration of ASA. “This is the first study where the genome-wide mutation rate of premalignant tissue was studied for over more than a decade. And the first to evaluate how asprin affects these mutation rates”, says Dr. Carlo Maley, one of the study authors from the University of California, San Francisco, USA. Eleven of the 13 study patients had not taken nonsteroidal anti-inflammatory drugs (NSAIDs) on average for the last six years and during the study had therefore started taking aspirin daily for an average of five and a half years. Two patients had already been taking NSAIDs on average for over three years and then had gone for almost the next eight years without taking them. Thus, the scientists were able to examine the mutation rates for different ASA intake patterns in the precancerous Barrett’s oesophagus example. The gender and race distribution of the study patients reflected the known demographics of oesophageal cancer. “This mainly affects middle-aged white men”, says Maley. Yet Barrett’s oesophagus rarely develops into oesophageal cancer. Studies indicate that the risk of developing an adenocarcinoma, so-called Barrett’s carcinoma on the base of a Barrett’s oesophagus, lies between 0.12 and 1.5 percent per patient-year. Other studies have shown that taking NSAIDs can significantly reduce this risk. The tissue samples from 11 of the 13 patients showed that through intake of acetylsalicylic acid the mutation rate decreased by a factor of 10. One patient to whom this did not apply was diagnosed during the course of the study with oesophageal cancer. “In all likelihood ASA does not have the same effect in all people”, the study authors suggest as the reason for this. A study involving more subjects could clarify the question. “Cancer is a disease that develops over decades as a result of numerous abnormalities in the genome of otherwise normal cells”, the scientists explain. Mutations are much more frequent in cancer tissue than in healthy tissue. Differing cell groups within a tumour mutate in a variety of ways. At some point in time, key mutations make the growth of tumour cells get out of control. “The diversity of mutations also contribute to drug resistance”, the scientists go on to add. “It is only when a tumour is well adapted to surviving treatments via these numerous mutations that it can easily propagate a population of cell clones which survive well and grow further”, says Maley. Tumours with – thanks to ASA – low mutation rates are poorly adapted and would die more easily through the usual therapeutic measures, the scientists declare in explaining the new approach using this anticoagulant. Maley and his colleagues suggest that the anti-inflammatory effect of ASA might be the reason why the drug slows the rate of mutation in cancer tissue. Inflammation is a response of the immune system and has in recent years been repeatedly correlated to cancers. “A weaker inflammation response due to ASA results in premalignant tissue with decreased production of oxidants which are known to damage the DNA”, says Maley explaining the relationship between ASA and a slowed-down rate of mutation. In this way, signals for growth stimulation going to the tumour would be attenuated. How nonsteroidal anti-inflammatory drugs exactly affect the rate of mutation and the development of cancer is something Maley wants to more closely study with his team in the future. The precancerous condition Barrett’s oesophagus and oesophageal cancer serve as a model. The researchers also want to test the correlation on lung cancer. Their findings could change current cancer treatment strategies: “Rather than trying to kill all the cancer cells, it might be better to stop tumour growth and mutations or slow them down”, states Maley. Acetyl salicylic acid as preventive not free of side effects! Until it is discovered exactly which groups of people at which age and using which doses of NSAIDs might be able to benefit from cancer prevention, taking one of these medications solely for cancer prevention is strongly discouraged, because ASA is not at all free from side effects: with intake of ASA the risk of major bleeding in the stomach, intestines or brain increases. “Especially because the risk from intake arises immediately and its benefits occurs much later, both aspects should be carefully weighed against each other”, John Baron of the University of North Carolina School of Medicine has already written in an editorial on the American meta-study from 2012. Until then it should remain as such: alongside breakfast only coffee and a good newspaper – not aspirin!